Why do people become priests? It is said that a priest is someone who lives with the people and each becomes a part of the other’s life. Priests work and serve within their communities. They serve individuals and families and are the spiritual leaders of our communities. Priests are very active people, with friends, hobbies and recreational activities like other Christian people. Some serve in schools, as university teachers, chaplains, or campus ministers, working in media, in hospitals or in prisons. The Order of the Most Holy Mary Theotokos is a rapidly growing religious community: we now have a membership that spans across the Unitied States and in several other countries as well. We need dedicated priests to serve as spiritual leaders in their communities. • How do you care for others, proclaim God’s word and foster church life? 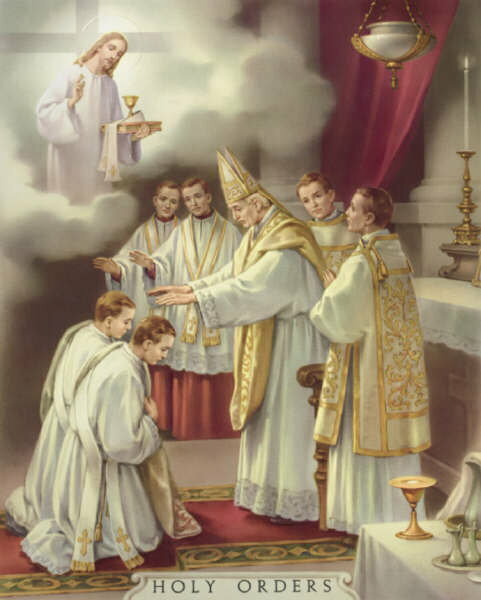 • Do you know someone possessing these qualities who could be called to priesthood? At the deepest level priesthood is about union with Jesus Christ: the goal is to become more and more like him. Being a priest is more than a job - it’s a way of life, requiring strong personal and professional commitment that is reflected in all that you do, all that you are. The opportunity to serve God and bring hope, joy, and healing into the lives of many people brings with it a deep happiness and a sense of peace. A religious priest commits oneself to the monastic life, and gives respect and obedience as he or she collaborates with his or her bishop. This type of relationship reflects the selflessness of Jesus and is a sign of the ultimate call to union with God. These commitments are a reflection of God’s enduring faithfulness to us. If you feel drawn to this life of service, share your questions with others. You may also know of someone who may make a good priest. Have you told them? Could you share this website with them? One of the functions of the O.SS.T. Ministerial Formations Committee is to help promote the need for prayer and support for all who may consider answering the call to the Diaconate and Priesthood within our community. We exist to foster support for those discerning a vocation to ordained ministry (priesthood and diaconate), seminarians for the "The Old Catholic Marianists", as well as recently-ordained or incardinated priests and decons. call to the priesthood men and women on fire with your divine love. you have chosen for priestly ministry. follow you with generous hearts. send labourers into your harvest.